I have hiked up and down Swale Canyon twice in the last two weeks. Clean air, it's up above the SO2 contaminated Columbia Valley airshed, so the sensitive lichen are large and of many species. Beautiful. 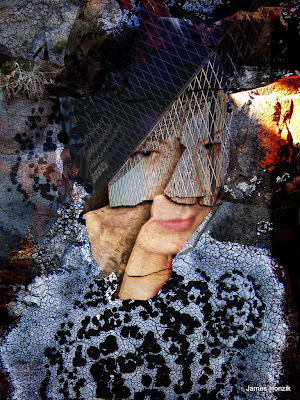 I have combined the lichen with a photo of the facade of the Rem Koolhaus Library in Seattle, (a fantastic building - I photographed it at dusk as light shimmered across its surface) and with a photo of Aimee, who loves to paint masks, and is off in Philadelphia now. The glowing light was from a beautiful, convoluted, crystallized, columnar basalt formation, just before sunset.